Stuart is always ready to play — ball or just about anything else. His little body is filled with love and he was a joy to paint! When entrusted to paint a member of anyone's fur family, I start with a good pencil drawing. I want to get him or her situated on the page just right. First I paint the eyes. Next I paint the nose and add a little more love to the eyes. The eyes, those windows to the soul, really need to shine forth. You'll see me smile while I paint these loving pets. I feel their love and I express my love for them back into the painting. When I'm pleased with the realistic features of the pet, I begin to play with color for the rest of the body. This is done in stages. Sometimes I'm asked to paint a pet in realistic colors. These are just as much fun and as much of a challenge as the colorful portraits; I love painting them just as much as the colorful pets. 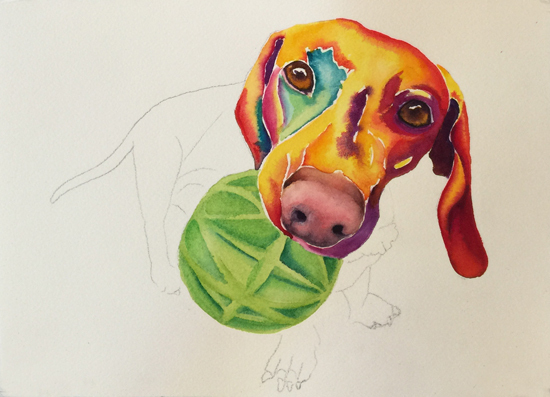 When painting in "Hawaiian-style" colors, I work to capture the nature of the pet with a joyful rainbow of colors. Any white lines between the colors show where the pencil lines were. They help me to remember the different planes of the face and the shifting of the color value I want to paint. I carefully paint around the lines so they can be erased when the painting is dry. The background comes last and is meant to highlight the portrait of the pet. If you can feel the love of the pet, and the love I felt for and from the pet while I was painting it, the portrait is a success. Stuart is one tiny, compact bundle of BIG loving energy! I had a great time being photographed by Jeremy DeWeese last month. It was SO much FUN! And then I got self-conscious about the experience. Silly Me! Human Me! What a GREAT experience!